This article is about the Best MP3 Tag Editors for Android that let you edit music tags on Android with ease. Music is something we all listen to, and we like to download our favorite songs on our phone to listen to them when there is nothing to do, or there is no internet connection to listen to music online. One thing that we all have experienced is empty or wrong tags in the details of the music file. You might have seen any music file having a different description of the artist or the album. Sometimes, there is nothing at all, and it shows ‘Unknown Artist’ or something like that. There needs to be a method to fix the wrong MP3 tags (also known as ID3 tags) or Edit Musci Tags on Android, and with no surprise, there are a ton of apps that let you do that. The list is in no particular order so you might find an app that you think deserves to be on the top but isn’t. All the apps that are mentioned in this article are available for free to download via the Google Play Store, so you don’t need to worry about downloading apps from the outside of Play Store. With over 5 Million downloads from the Play Store, the Start Music Tag Editor is one of the best MP3 Tag Editors for Android that you will find on the Play Store. Sadly, the app was last updated on November 15, 2016, which means the developer is no longer working on the updates. So, if you find any bugs, then you can only hope for the developers to bring an update to the app, the chances of which are few to zero. If you love the material design, this app is going to disappoint you for sure as it has the old school app design that we rarely see these days. One thing that will annoy you is the ads that this app has. Since the app is free to download, the developer needs to earn some money via the app and that is done through the ads. Looking at the reviews, it seems that the ads can be way too excessive sometimes which will force you to close the app. Fix tags in music files permanently (Suggested). Fix Android database only, does not affect the music files. ID3Fixer also supports different types of tags like ID3v1, ID3v2, MP4 and WMA tag. This makes it a pretty versatile and handy app when you need to edit music tags on Android. Just like the Star Music Tag Editor, the app is no longer maintained by the developer, and the last update was in 2015. So, you cannot expect a lot of features in the app. 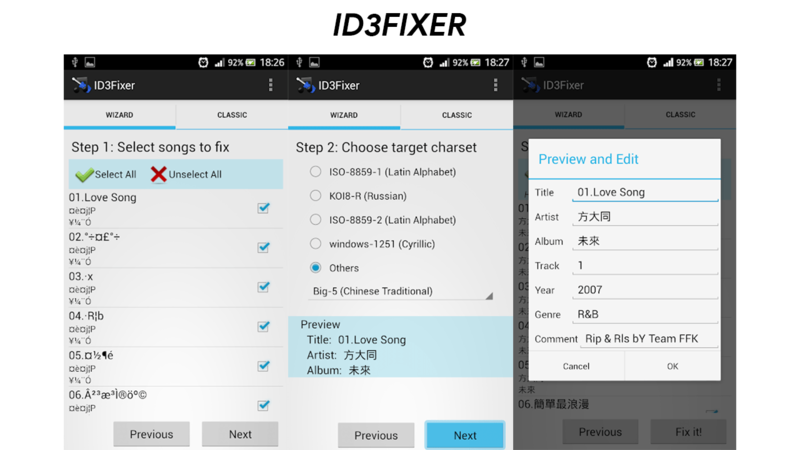 ID3Fixer can read the ID3/WMA/MP4 tags(artist name, album name, song’s title, etc..) with the charset you assigned, and you can preview the results before apply to prevent the wrong operation. Currently, support charset: English, Chinese Traditional, Chinese Simplified, Japanese, Korean, Eastern European, Cyrillic, Western European, Greek, Turkish, Hebrew, Arabic, Baltic, Vietnamese, South European, Thai, Russian, Unicode. DON’T MISS – Ad Blocker for Android – 6 BEST AdBlockers for Android: GOODBYE ADS! Well, what if there is an app that edits the tags automatically since manual editing is a pretty boring task. The Automatic Tag Editor does the same thing. It is one of the unique tag editing apps for Android that automatically edits the tags by analyzing the music on your phone. So, gone are the days when you had to edit each detail of a music file manually. The developer claims that it takes just 5 seconds for the app to fix the tags for each song. And that’s not all: it also gives you some squared hi-res pictures you can use as cover art by tapping on them. Finally, it updates the embedded tags, so you don’t lose them when you move files away from your phone. It also supports editing files on SD card and formats like MP3, M4a, Ogg, Flac, Wma and Wav are supported by this app. So, it is indeed one of the fastest MP3 tag editors for Android since it does all this automatically. And did we mention that this app is one of the few Tag Editor apps for Android that feature the clean material design and regular updates from the developer? At the time of writing this article, the app was last updated on June 21, 2018. The app has great reviews and over a million downloads already. 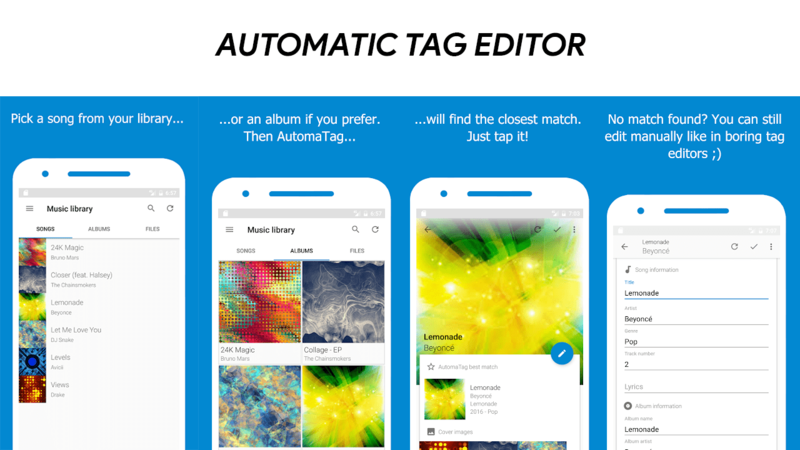 Just like the Automatic Tag Editor, the AutoTagger app comes with a clean material design, and in our opinion, this is the most beautiful looking app on the play store to edit music tags on Android. The main focus of the application is automatic searching for the tags and batch tag editing so that you don’t have to waste your time editing tags for each song individually. There is also an active Google Plus Community for the application where you can request more features. Overall, this a great tag editing app for Android and deserves to be on this list of best MP3 Tag Editors for Android. At the time of writing this article, the app was last updated on July 3, 2018, and already had 100K+ downloads. One thing that you might have noticed is that while other websites or blogs write about more than 5 best MP3 Tag Editors for Android, we mentioned just 4. Why? Well, we wanted to talk about only those apps that have got good reviews and downloads but also, they are updated by the developers. 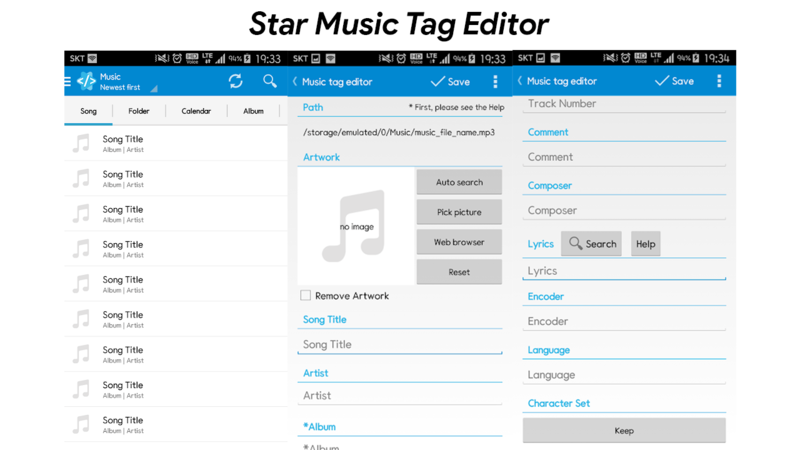 Apps like the Star Music Tag Editor and ID3Fixer were last updated a couple of years ago, but still, we have them on the list since they have some amazing features that still work. Also, apps like Automatic Tag Editor and AutoTagger deserve to be on the list due to excellent reviews and material design. If you have any suggestions for this list or want to let us know about any app that still deserves to be in the list, then make sure to let us know via the comments section.